There are usually around 70–80 people around the world that are buying our creations for resale. We think they deserve a bigger discount than the one we give everyone else. Our 'resale packet' (see below) will have our current discount pricing. 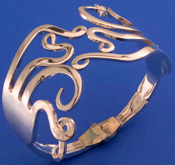 There is no discount on solid sterling silver pieces, and they will cost a lot more than silverplate, brass, or stainless steel. Silver prices are always changing, so call ahead to see if we can supply it and what the cost would be. In addition, we charge resellers 'as close as we can figure' to actual shipping charges. Since the shipping charges can't be calculated until the box is ready to go, we prefer you use a credit card for payment. We try to ship all orders within a week. Orders over $500 may take longer. If you email me a postal address, I can send you the complete 'resale packet'. We are no longer printing a paper catalog. Our website will always have the correct and current prices. Resellers cannot order through the website to get our extra resellers' discount. Once we have you set up as a reseller, your orders can be placed via phone or email. If by email, please use the subject line: "order, store name, date" to speed up the process.